A lovely challenge this week at The Shabby Tea Room, 'Sweet Hearts' your card must contain hearts and there's a beautiful inspiration photo this week with the colors pink, green and brown. This week's sponsor is Robyn's Fetish Digital Stamps, I used the I heart U image. I made this card with a couple more challenges in mind the Appearance of Cameos at Moxie Fab World, All You Need is Love at City Crafter Challenge Blog and Color Combo Challenge #178 at Color Combos Galore. 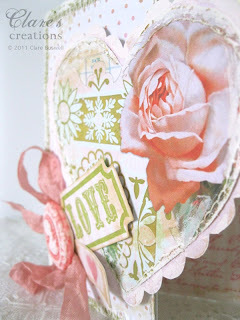 Inside the digital heart stamp that I cut out I put this gorgeous digital collage heart from Quirky Twerp, Donna has a fabulous set of 4 Collage Hearts FREE for you on her blog! How generous!! 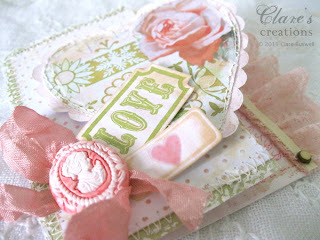 I fell in love with this vintage rose image, it's so pretty! I'm still playing with those molds I got from Mold Muse on Etsy, I love the cameo mold, here I used white Fimo and painted it with some acrylic paint. The Love stamp is from Studio G and the little heart stamp is from Sweethearts from Waltzingmouse Stamps. I'm so pleased with how it turned out, it has all the elements I just love!! I might just have to keep this one for myself!! 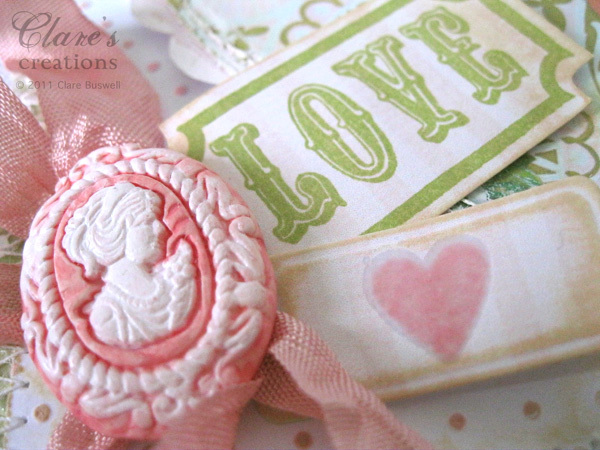 : ) Don't forget to check out the rest of the Shabby Girls creations, oh and there's a DT call on at the moment at The Shabby Tea Room, just one week left to enter!! Other: Spellbinders Tags Trio, Die cutting machine, sewing machine, clear embossing powder, heat gun, lemon vintage style brad, Swiss dots embossing folder, cottage floral embossing folder, white fimo, cameo mold, acrylic paint, lemon picot ribbon, pink gathered lace, dusky rose seam binding, foam pads. A gorgeous card yet again Clare :), I love that heart, and the cameo mould is lovely, love everything about it really lol. Great job! Gorgeous card...love all the pretty girlie details!!! And that cameo is the prettiest one I have seen!! Oh wow, another sweetHEART, thanks for sharing it with us at CCCB! WOW another amazing creation - your work is just soooooo wonderful and inspirational - how do you do it!!!! love the soft colors you have used. such a beautiful work of art, clare! you have a lovely blog, too! 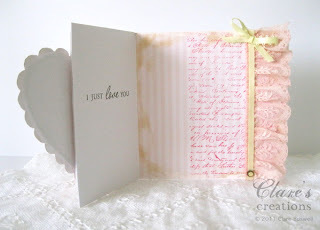 Another gorgeous card! 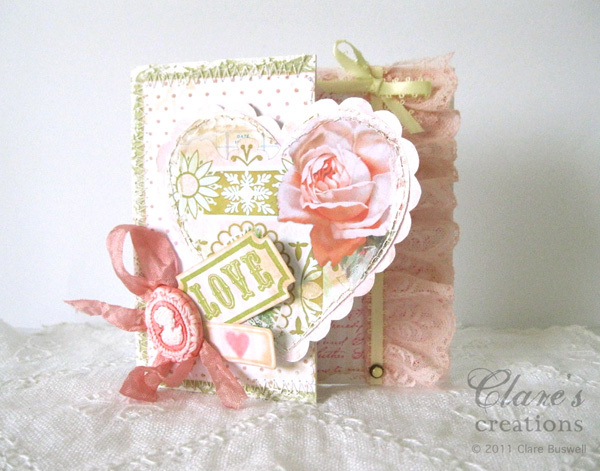 Love the lacy edge and that vintage rose. This is so beautiful.. So soft and lovely.. Thanks so much for playing along with us over at CCCB! Oh this is simply stunning! I love the cameo you used!! What a wonderful creation Clare! LOVE the cameo - rushing off to check them out on Etsy!!! Absolutely GORGEOUS!! thank you for joining us at CCCB! I'll keep it short :) I AM IN LOVE. Frame this beauty; it;s priceless!! I've finally got around to posting up my thanks for my Stylish Blogger Award - hope you can forgive for taking so long to do it - as I was delighted to received it from you. Hi Clare I think I've already commented to you this morning, but I'm having a bad morning and just want to make sure so I'm commenting again!!! Wanted to thank you so very much for my Stylish Blogger Award - I was really pleased to receive it, but so sorry it has taken me sooo long to post it - hope you can forgive me! WOW! I just saw this. I love seeing what you created with my freebie. You have a magic touch, that's for sure!!! Total girly gorgeousness! Nice job on the cameo. lovely card. do you know the name of the Prima script stamp?